All topics discussing mopar trucks from the late 30's to mid 50's including "W", "B" and "C" series. Job Rated, Pilothouse or Forward Look and bone stock or modified this is your forum! Frequently asked technical questions of common repair and maintenance topics. Forum announcements including new features, scheduled downtime and information about outages. 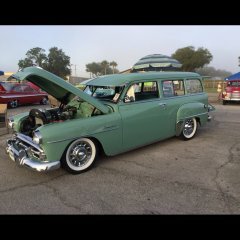 Use this forum to post threads of interest not mopar car or truck specific. Religious or political threads are not allowed and will be deleted. Use this forum to post "For Sale" referrals from other sites such as Ebay, Craigslist or HAMB. They will be automatically deleted after 30 days. DPETCA - Dodge Pilothouse Era Truck Club of America. Club announcements, membership information and events. A fellow forum member go out of their way to help you or a remembrance is needed? This is the spot to share the information.